Our events provides you with local tradition, European charm and professional performances. Popular events attract both inhabitants of Görlitz and tourists. Melting clocks, crutches and burning giraffes made him famous all over the world, but the Spanish artist Salvador Dalí has also gained notoriety as a graphic designer. The “Kulturhistorische Museum” in Görlitz and Zittau show around 350 drawings and illustrations by Dalí. With one ticket you can visit the exhibitions in Görlitz and Zittau! 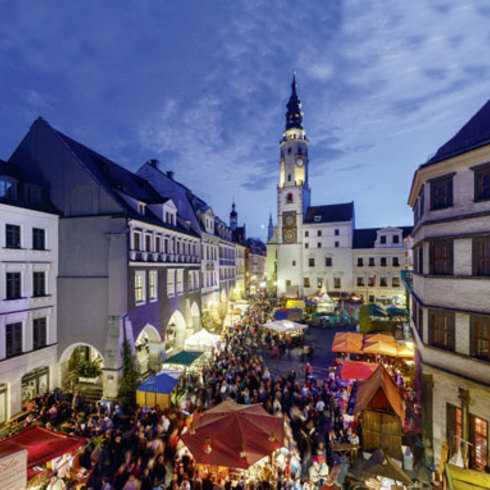 The Görlitz Jazz Festival blends concerts of different jazz styles with an experience of the exceptional architecture of our almost thousand-year-old city. Year after year, this marathon attracts larger numbers of participants, for the journey through two neighbouring European countries with their distinct atmospheres. The various churches of Görlitz present a musical festival of a special kind. Streets, squares and parks are turned into one big open-air stage for great international theatre companies. Potters from all over Germany come to Görlitz for this special market. A great variety of supporting events serve to revive Silesian traditions. For three days, the historic city centre of Görlitz and one of the districts of Zgorzelec are turned into a stage for a historic spectacle where both locals and visitors enjoy the biggest festival in the region. This is a great day for getting to know those monuments and heritage sites in Görlitz which are usually inaccessible. Craftspeople and traders present commodities and delicacies from Silesia, Saxony, Poland and Bohemia. Visitors have the exclusive chance to look at more than twenty restored, non restored, well-known and unknown houses of all architectural styles which are usually not open to the public.